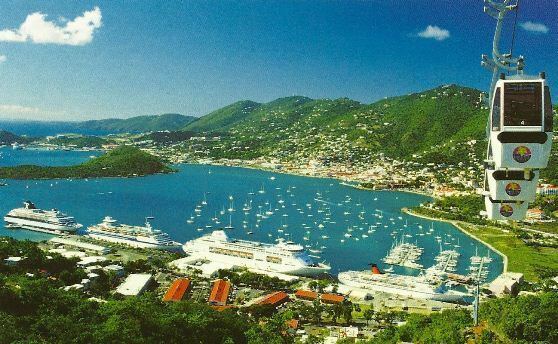 Charlotte Amalie ( or ), located on St. Thomas, is the capital and largest city of the U.S. Virgin Islands, founded in 1666 as Taphus (meaning "beer houses" or "beer halls" ). In 1691, the town was renamed to Amalienborg (in English Charlotte Amalie) after Charlotte Amalie of Hesse-Kassel (1650–1714), queen consort to King Christian V of Denmark. It contains a deep-water harbor that was once a haven for pirates and is now one of the busiest ports of call for cruise ships in the Caribbean, with about 1.5 million cruise ship passengers landing there in 2004. Protected by Hassel Island, the harbor has docking and fueling facilities, machine shops, and shipyards and was a U.S. submarine base until 1966. The town has been inhabited for centuries. When Christopher Columbus came here in 1493, the area was inhabited by both Island Caribs and Taino. It is located on the southern shore at the head of Saint Thomas Harbor. In 2010 the city had a population of 18,481, which makes it the largest city in the Virgin Islands Archipelago. Hundreds of ferries and yachts pass through town each week, and at times the population more than doubles. The city is known for its Danish colonial architecture, building structure and history, and a dozen streets and places throughout the city have Danish names. Charlotte Amalie has buildings of historical importance including St. Thomas Synagogue, the second-oldest synagogue in the Western Hemisphere, and the oldest Lutheran church in the Western Hemisphere, the Frederick Lutheran Church. The town has a long history of pirates, especially stories of Bluebeard and Blackbeard (Edward Teach). In the 17th-century, the Danes built both Blackbeards Castle and Bluebeards Castle attributed to the pirates. Blackbeards Castle is a U.S. National Historic Landmark. Another tourist attraction is Fort Christian, the oldest standing structure in the Virgin Islands Archipelago. A copy of the Liberty Bell is located in Emancipation Park, which is a tourist attraction. On his second voyage to the New World, Christopher Columbus encountered numbers of Native Americans living in the present day archipelago of the United States Virgin Islands. Archaeological records indicate that the islands have been home to Indian tribes, including the taino people, arawak people, kalinago people, and the ciboney people. Several of them lived in present day Charlotte Amalie in small fishing communities. As was the case in most of the Americas, the native population died relatively quickly from disease when the Europeans settled. As the Spanish early focused their energy on Puerto Rico and other Caribbean Islands, Saint Thomas remained unprotected for a long time, leaving Charlotte Amalie’s sheltered coves to be frequented by pirates, including Bluebeard and Blackbeard, as well as mariners and European settlers. Located mid-island on the south shore of the mountainous island of Saint Thomas, Charlotte Amalie stretches about 1.5 miles around Saint Thomas Harbor from the Havensight district where the cruise ships land in the east, to Frenchtown and the Sub Base neighborhoods on the west. The red walls of the Danish Fort Christian and the open space of Emancipation Garden and the Vendor’s Market are the center of old town. Many of the city’s historic buildings and businesses stand on the slopes of Government Hill just north of Emancipation Garden. This is “Kongens Quarter”. To the west, spanning the area between Waterfront Dr and Dronningens Gade (Main street), are a score of alleys, each lined with colonial warehouse buildings that have been turned into stores and urban malls. Protected by the peaks of Water Island and Hassel Island, Saint Thomas Harbor makes a deep indentation in the island. The bay affords vistas from lookout points as high as 1,500 feet (460 m), including for instance Drake’s Seat. Charlotte Amalie is built on three low volcanic spurs called Frenchman Hill (Foretop Hill), Berg Hill (Maintop), and Government Hill (Mizzentop). Charlotte Amalie is located at coordinates 18°21 north and 64°57 west. The economy is based on tourism, handicrafts, jewelry, and the production of rum, bay rum, and jams. As well as being the USVI’s political capital, the city is also the port capital of the U.S. Virgin Islands. 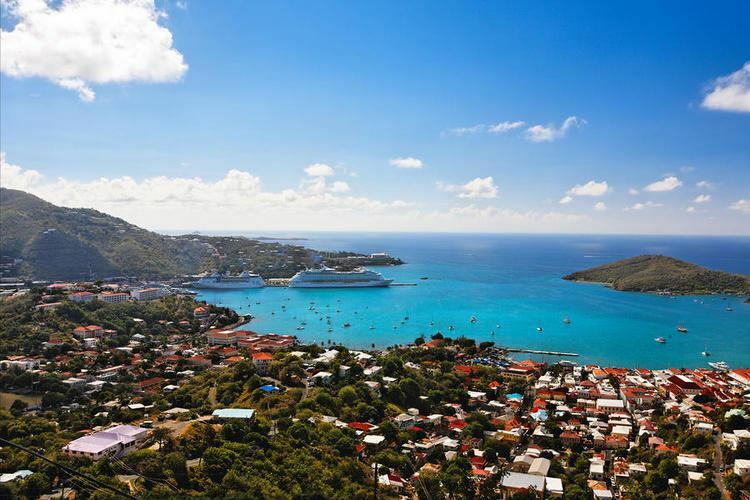 With more cruise ship visits a year than any Caribbean island, Charlotte Amalie is the most popular cruise ship destination in the Caribbean Sea. Up to eleven cruise ships can occupy the harbor on any given day – though usually there are about five. The culture is a mixture of American- and Afro-Caribbean culture, with an influence from Danish colonial history. There are American fast food chains located in the city, as well as local restaurants serving only Caribbean cuisine. Grocery stores contain American items, but also include local items such as rum. Seafood and local produce can be found at open-air markets.